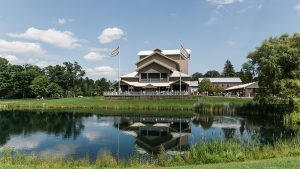 The Glimmerglass Opera Guild averages almost 3,000 hours of volunteer service each year, supplementing the work of the full-time and seasonal staff when extra work is required. The Guild provides essential support through its service, fundraising and education programs. This commitment of time, expertise and energy allows the company to devote more resources toward fulfilling its mission. Every year, a Glimmerglass Opera Volunteer of the Year is selected and honored for his or her extraordinary work. This year, Tom Simpson received the honor. In a brief interview, Simpson discusses his work with the Glimmerglass Guild. 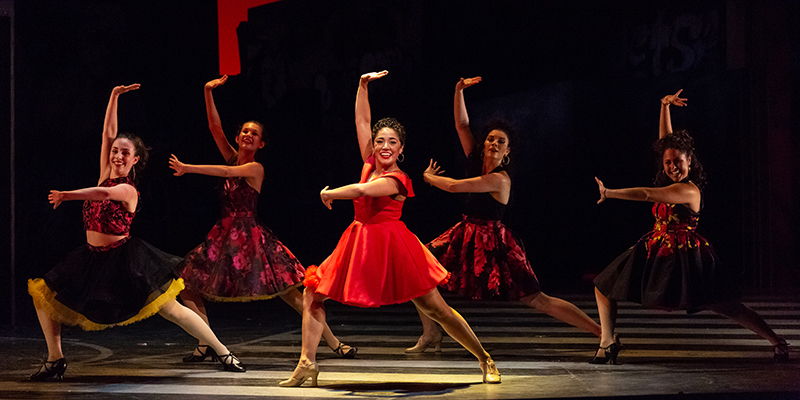 GO: When and why did you start coming to Glimmerglass? TS: My parents spent summers in the area to escape the heat of Oklahoma, where they lived the rest of the year. They enjoyed opera and were delighted with the Glimmerglass performances they attended at the [Cooperstown] High School. When the Opera moved to the Alice Busch Opera Theater, they insisted I come up from Manhattan to attend the opening night with them. So, opening night in the new theater was my first experience with Glimmerglass. 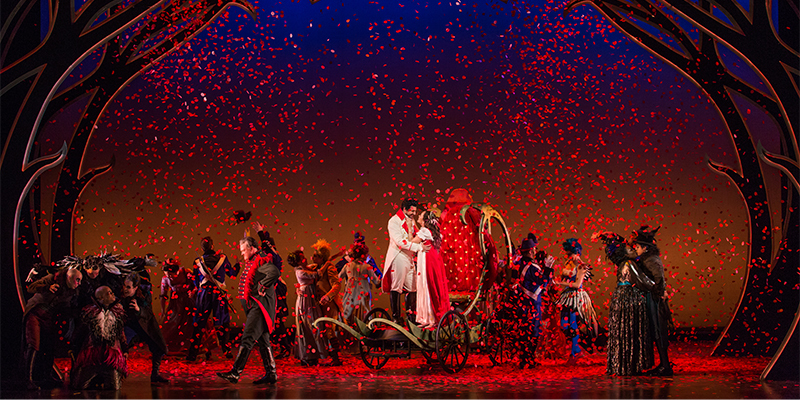 GO: How did you become involved with the Glimmerglass Opera Guild? TS: Several years ago I had the great pleasure of meeting Mona Harris through a mutual friend. The luncheon conversation quickly turned to our shared love of opera. She spoke very highly of the work of the Guild and suggested I join. I didn’t at the time because I spent little time upstate. I now realize there are many ways in which one can play a role in the success of the Guild without living in the area. Later, after I retired, I met Richard Johnson who, with his wife Harriett, edits the Guild Newsletter. He spoke so highly of the work of the Guild that I decided to join. GO: What volunteer activities have you participated in this past year? Have you initiated any new projects or taken the lead on existing projects? TS: I became a member of the Guild Board last year and served on the By-Laws and Education committees. For the latter I moderated a panel discussion focusing on Gian Carlo Menotti’s opera, The Consul, which was performed last summer. I also ushered at several performances, and happily no one choked on the turkey I made for the Guild’s Eat and Greet dinner. As for new projects, the Guild is always seeking ways to increase awareness of opera in the area, promote its efforts within the current Glimmerglass family and to support the Opera management. The Education Committee, under the leadership of Abby Kreh Gibson, does wonderful work in that regard. The Committee is already at work planning the programs for next spring. I can assure you that there will be some very interesting and exciting presentations. I am delighted to be serving as Vice-President of the Guild in the upcoming year and to be working with the Guild Board’s new President, Ed Brodzinsky. Following the precedents of his predecessors, Ed is enthusiastically encouraging every member to come forward with new and innovative ideas to assist the Opera. During these difficult financial times, the work of the Guild becomes of particular importance. In response, members have already submitted some very interesting ideas. It’s premature to mention them now, but I think Opera management will be pleased with the ideas being proposed. 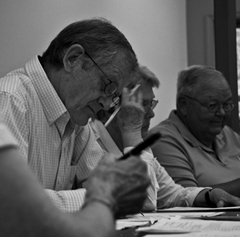 Simpson at a By-Laws Committee meeting. Photo: Peyton Lea. GO: What is the most rewarding part of volunteering? TS: Easy. Meeting and working with a very interesting and incredibly diverse group of people toward a common goal. Had it not been for my involvement with the Opera I’m certain I would not have met some of the people I now consider very good friends…that doesn’t happen often in life. GO: What makes volunteering at Glimmerglass Opera so special/so different than volunteering elsewhere? TS: That’s also easy. Every time a volunteer takes a seat in the auditorium and the conductor enters, the lights dim and the music begins, he or she can take pride in knowing that, whether through a donation, feeding the Opera’s staff, crew and artists, ushering or community outreach efforts, that performance is happening in part because of his or her efforts. Without the generosity, dedication and hard work of the volunteers, Glimmerglass would be a very different experience. 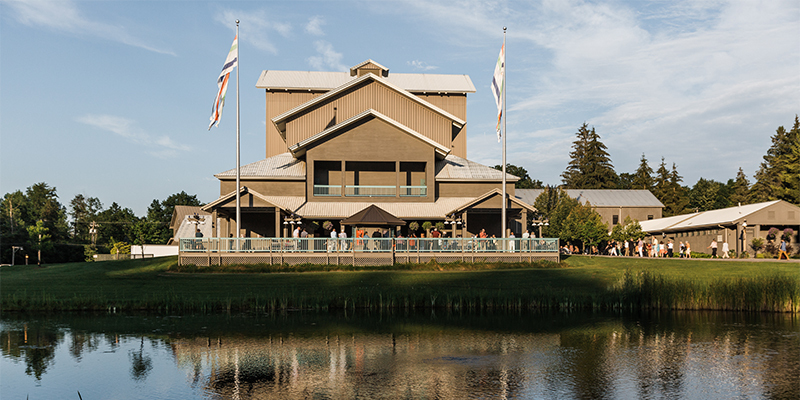 GO: What has been your favorite show at Glimmerglass and why? TS: That’s not so easy…I have a great many favorites. I suppose the best way to answer that is to think of the productions I wish could be revived. Five come immediately to mind: Of Mice and Men, The Good Soldier Schweik, both primarily because of the astounding performances of Anthony Dean Griffey, Death in Venice, Girl of the Golden West and last summer’s Dido and Aeneas. And I would love to hear Mary Dunleavy’s Violetta again. I find it hard to remember a more complete portrayal on any opera stage. She was terrific. Looking ahead, I am very excited about this coming summer. In particular, Anthony Roth Costanzo’s portrayal of Handel’s Tolomeo and the The Tender Land, which will feature 2010 Young American Artists. You will notice that four of the five operas I would like to see repeated were written in the 20th century. Prior to attending performances at Glimmerglass my interest in opera, though intense, began with Mozart and ended with Puccini. I owe a great deal to Glimmerglass for introducing me to many great works of the 20th century…many of which have now become favorites. 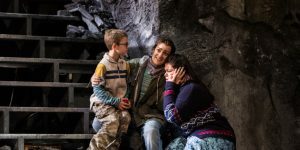 Likewise, no greater case for the pre-Mozart period could be made than Glimmerglass Opera’s productions of Giulio Cesare in Egitto and this past summer’s Dido and Aeneas. GO: What would you say to anyone who is interested in becoming a Glimmerglass Opera volunteer? TS: What’s taken you so long? What a great motivator this interview was for me. The phrase “there are many ways in which one can play a role…without living in the area.” resonated with me. I am also interested in providing “remote” volunteer support to a performing arts organization . I think that creation of a supporting Guild would create just the right structure to organize available volunteers and permit just such remote support. Would the Glimmerglass Guild be willing to share a copy of its By-Laws to as a model for other performing arts organizations? BTW, I attended Glimmerglass Opera for the first time this past summer and found it to be a life-transforming experience. I’m so glad to hear you enjoyed the interview. There is actually a Guild Board meeting this afternoon. I will ask about sharing the By-Laws.